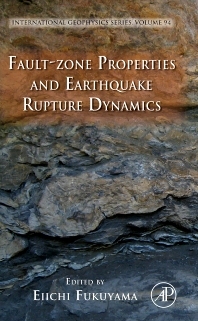 Title "Fault-zone Properties and Earthquake Rupture Dynamics"
The dynamics of the earthquake rupture process are closely related to fault zone properties which the authors have intensively investigated by various observations in the field as well as by laboratory experiments. These include geological investigation of the active and fossil faults, physical and chemical features obtained by the laboratory experiments, as well as the seismological estimation from seismic waveforms. Earthquake dynamic rupture can now be modeled using numerical simulations on the basis of field and laboratory observations, which should be very useful for understanding earthquake rupture dynamics. Also has potential use as a supplementary resource for upper division and graduate geophysics courses. Primary Market: Graduate students and scientific researchers in seismology and/or structural geology/rock mechanics. Secondary Market: Professors and researchers in Earth Sciences who are interested in earthquake source physics.